Lyyti boasts a built-in questionnaire tool, so there's no need to mess with external survey platforms ever again. 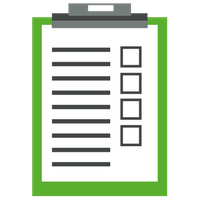 A Lyyti questionnaire can be applied to all kinds of surveys, as all the question types and answer scales are decided by you. The questionnaire can be connected to a Lyyti event, or it can stand alone. A questionnaire is accessed via a personal link - include it anywhere, just like any other Lyyti link. The survey results are available both as a spreadsheet and as a graphic presentation. Share them via an online report link! Both the questionnaire tool and Lyyti's registration page are more than suitable for all kinds of form-building needs. Use drop-down menus, multiple choice, open text fields or scales at the same time in one form. Sometimes some of the questions are irrelevant to some recipients, but that's fine because the irrelevant questions are easy to hide. Simply apply filtering terms to connect certain questions to specific follow-up questions! The shorter and simpler a form looks, the more likely it is to be filled out and submitted. Would you like to see Lyyti's questionnaire tool in action?